Liberia is unique. It’s the only African country founded by United States colonization while occupied by native peoples. The process was begun in the 1820s by freed slaves, who were encouraged by the American Colonization Society, which believed those former slaves would have greater opportunities in Africa. Since then Liberia has had a troubled history, and trouble haunts the four souls who are sailing there from the United States, aboard a former whaler, the Turner, in 1896, in Christina Anderson’s fraught new play, pen/man/ship, now at at Magic Theatre. Those people are all black. So is the crew, though we never see them. That’s because the drama plays out almost entirely in one cramped belowdecks cabin. Its main occupant is a stern, conflicted, alcoholic clergyman named Charles Boyd. We learn early on that he’s the one who both engaged the ship and its crew, though the reason remains unknown for a while. Boyd clenches it to his chest as if he’s ashamed of it, and maybe he should be. He’s also a land surveyor, it turns out, and the truth he’s reluctant to allow into the light has to do with building prisons in Liberia. There’s lots about light and dark, real and metaphorical, in the play, like undercurrents flowing threateningly under the ship. It’s a rough ride psychologically and morally as well, as Boyd struggles to keep his son, Jacob, in line. The pair bickers about much, especially about the woman Jacob has mysteriously brought along. Her name is Ruby Heard, and she’s bold and outspoken. Not surprisingly Boyd doesn’t like her one bit. She’s escaping an America that’s held her down, not only because she’s black but because she’s a woman, but she’ll have no more of oppression, she flings in his face. It turns out he’s right to mistrust her. Magnetic and clever, she gains the crew’s trust and eventually becomes its unofficially elected leader. Halfway through the play, she’s in firm command, and the rough justice of a hanging threatens. The play’s title, pen/man/ship, comes from the journal Boyd keeps and reads to us, but it also hints at both the penitentiary the ship becomes for him and the penitentiaries he means to help build. He’s a self-righteous black man who plans to collaborate in the imprisonment of other black people. Can his conscience face up to that? Tautly directed by Ryan Guzzo Purcell, the play is focused and fervent, its tensions enhanced by the claustrophobic cabin in Angrette McCloskey’s stylized set of wooden slats and beams, by Ray Oppenheimer’s expressive brown-hued lighting, and by Sara Huddleston’s sound design of rushing water, sea birds and the creak of timber. Antonia Gunnarson supplies fine period costumes. The actors fill their roles with fierceness and irony: Eddie Ray jackson as Jacob Boyd; Adrian Roberts as his son, Charles; Tangela Large as the determined Ruby, and Tyee Tilghman as the self-effacing but not unwise Cecil, a crewman who becomes Boyd’s confidante and friend. Pen/man/ship plays at Fort Mason until June 15th. Magic’s 2014-15 season sets out with the Bay Area premiere of Joshua Harmon’s comedy, Bad Jews, in the fall. For tickets/information, call 415-441-8822 or visit www.magictheatre.org. 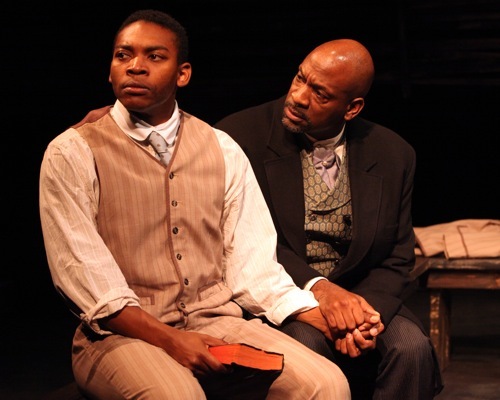 Photo of Eddie Ray Jackson as Jacob Boyd; Adrian Roberts as his son, Charles.